While volatility has definitely picked up in recent weeks, the S&P500’s propensity to trade sideways remains the same. This summer we were stuck in a tight range between 2,170 and 2,190. Now we find ourselves marooned between 2,120 and 2,150. The more things change, the more they stay the same. The last couple of days have been low-volume throwaways as most traders sit on their hands ahead of the Fed’s interest rate decision due Wednesday. The brief September swoon was fueled by fear of an impending rate-hike, but the reactionary selling was short-lived as the consensus quickly determined the Fed doesn’t have the courage to bump interest rates this month. In less than 24-hours we will know if the crowd got this one right. I side with the consensus and think the Fed will hold off until the final months of the year. But just because the Fed remains stationary doesn’t mean stocks will rally. If the crowd expects no change, then that decision is already priced in. We could very well see a brief pop as uncertainty and risk evaporates following a no-change policy statement, but after that we are more likely to see a sell-the-news than a runaway rally. Delaying the first rate-hike by a few weeks isn’t going to change anything and the market is likely to see it the same way Wednesday afternoon. While I remain bullish and expect stocks to finish the year strong, three-months is a long time and a lot can happen between now and then. Clearly the September selloff lost momentum as we keep bouncing off 2,120 support. Gone is the anxiety and fear as owners feel more comfortable following a rebound off of the recent lows. But the thing that concerns me is our inability to break out of this consolidation. If we were truly oversold, we would have bounced higher and not looked back. That means we are not oversold yet. The longer we hold near support, the more likely we are to violate it. If we cannot escape this trading range by the end of the week, expect the next move to be lower. Breaking 2,120 support will launch another wave of reactionary selling as we trigger all the stop-losses under this widely followed technical level. That will be followed by another wave of reactive “sell before things get worse”. But not long after that, expect the supply to dry up like it did on September 9th. Most owners know a 0.25% bump in interest rates doesn’t change much and will continue to confidently hold their stocks, just like they did through the Brexit, the last rate-hike, and all the other bearish headlines that came across the wire this year. No matter what the “experts” think should happen, when confident owners don’t sell, supply remains tight and prices firm. If we pop following a no-hike decision Wednesday, I wouldn’t chase it because we will likely run out of buyers near 2,180 like we have so many other times this year. But if we crash under 2,120 support in a sell-the-news reaction, stay calm and let other people dump good stocks for steep discounts. The most ambitious of us take advantage of the opportunity and buy the bounce off of 2,100 support. If the selloff is sharp and volume extremely high, that will finally be the capitulatory bottom we’ve been waiting for. The Big Move Came. What Happens Next? My August 30th free blog post was titled “The Next Big Move is Coming“. By almost all standards Friday’s 2.5% freefall qualifies as that move. We’ve been lulled into complacency by this summer’s tight, sideways trade, but we knew it couldn’t last forever. Friday’s volume was the highest we’ve seen since the Brexit, but certainly not over heated considering the size of the accompanying price move. 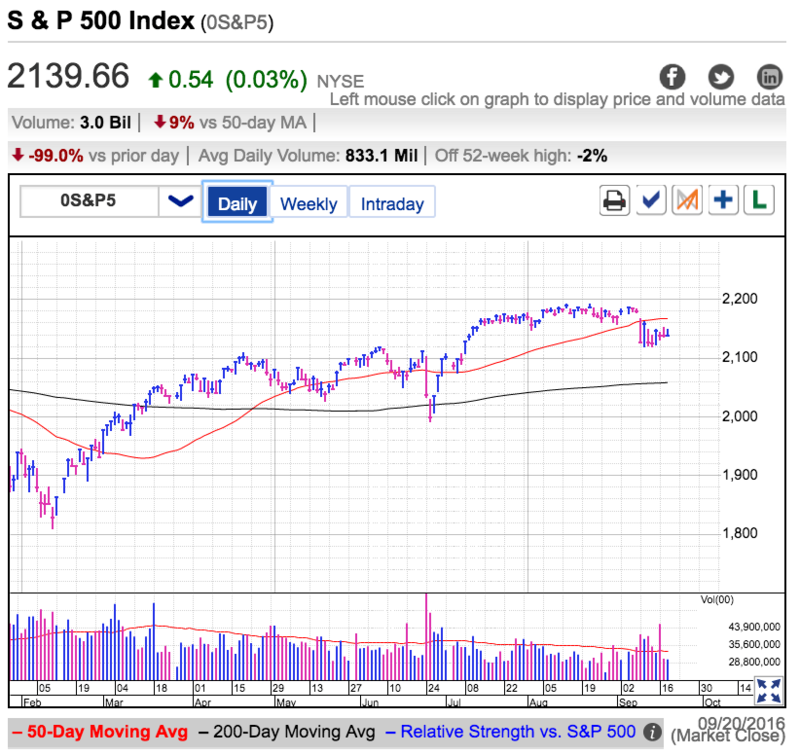 The selloff crashed through all kinds of technical levels and triggered most automatic stop-losses, but the relatively constrained volume suggests we didn’t set off a frenzy of reactive and emotional selling. That can be good or bad depending on how you look at it. It is nice to see most owners remain calm during a painfully ugly period. That bodes well for a rebound if these owners keep their composure next week since confident owners keep supply tight. But the opposite argument is Friday’s turnover didn’t look capitulatory. That could lead to further losses if emotions and fears flare up next week. A major theme in my August 30th blog post was the risks associated with holding a sideways market. Every day we own stocks we expose ourselves to the unknown. When we buy right, the market moves in our direction and we get paid for holding that risk. But in a sideways market, we don’t get compensated for holding risk. All risk and no reward is a lousy trade. Long-term investors can sit through these flat stretches and subsequent gyrations, but shorter viewed traders should avoid owning flat markets. Quoting William O’Neil, “all stocks are bad unless they are going up”. While it is helpful to critique the past, what everyone really wants to know is what comes next. The widely circulated explanation for Friday’s selloff was disappointment over no additional stimulus from Europe and the prospects of a near-term rate-hike by the U.S. Fed. Allegedly this “news” turned traders into sellers on Friday. The question for us is if this was a one-day tantrum, or the start of something far more significant. The key is figuring out the real reason people were selling on Friday. Anyone who honored their stop-loss levels was flushed out automatically as the market smashed through every technical level established over the last few months. While this technically driven selling added fuel to the fire, there are not many technical levels left to violate. That means most of the autopilot selling is behind us, allowing us to focus on the trading decisions made by humans. Humans sell for rational reasons and they sell for emotional reasons. Let us start by examining the rational hypothesis. The Fed is going to raise interest rates at some point in the near future, the only real debate is if that 0.25% hike comes in a few days, or a few months. You have to be living under a rock if you don’t know it is coming because the media has been obsessing over it for years. We survived the first rate-hike last December and even traded higher following it. Were traders really selling on Friday because they are afraid of a 0.25% rate hike? Let me ask you, are you afraid of a 0.25% rate hike? Or is something else driving people to sell? If traders are not selling because of the rate hike, why are they selling? It comes down to Game Theory. People are not selling because they are afraid of a rate-hike personally, they are selling because they think other people are afraid of a rate-hike. The financial press has conditioned us to believe stocks are going up because of easy money and prices will fall once the spigot is turned off. Say something enough times and people believe it. We make money in the stock market, not by predicting the future, but predicting what other traders will do. Even though we might not fear something personally, if we think the crowd will get spooked by a headline, we will sell ahead of the anticipated decline. That is what really happened Friday. Traders are not selling the economic damage of a rate-hike (real), they are selling ahead of what they think will cause a selloff (imagined). What does it mean if most traders are only selling because they think other people will sell? It means there is no meat to this selloff. If no one is changing their personal outlook about the economy, then they will continue to have the same appetite for stocks. While they might cash in some chips ahead of the widely expected “rate-hike crash”, they will jump back in once the waves settle down. Value investors are not afraid of a trivial bump in interest rates and will start buying the dip once prices get so attractive they cannot resist. This pullback also gives underweight money managers the opportunity to salvage their year by buying stocks at prices they wish they had bought earlier in the year. When there is no real fear in the market, traders jump back in quickly and is why this rate-hike weakness will be short-lived. 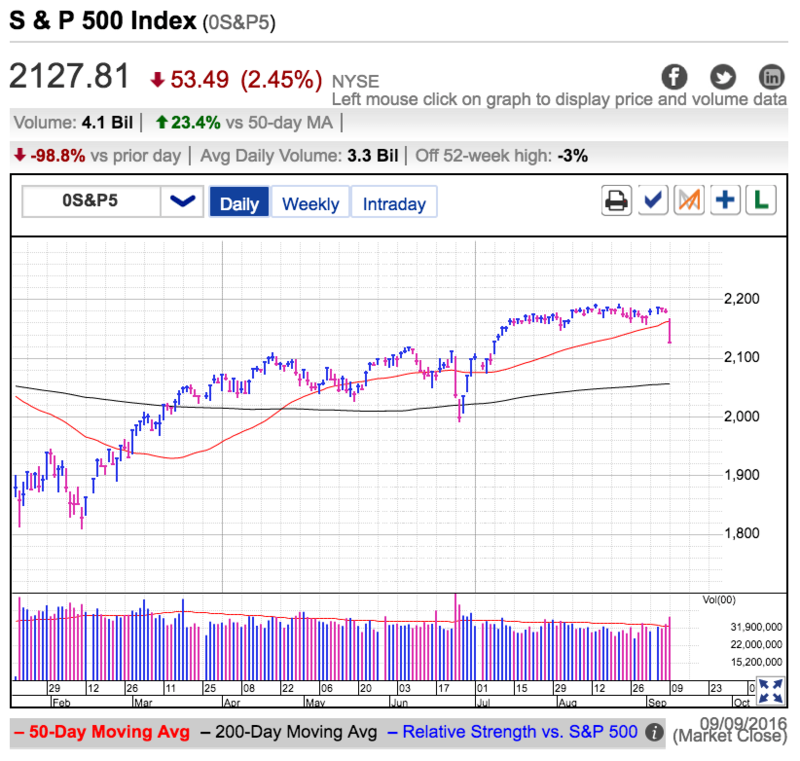 No doubt emotion and fear could flare up Monday as traders sell “before things get worse”, there is very little substance behind this move and we should be looking to buy it, not sell it. There is no reason to rush in and catch a falling knife, but once prices stabilize, don’t dally and miss these bargains because they won’t last long. Are you personally afraid of interest rate hikes? Or are you going to take advantage of these discounts? Let me know in the comments below.